All of the above choices seemed ridiculous when we had a concrete mixer readily available. But, it wasn’t working. So, could we fix it? Sometime during projects many years ago, the original motor on the concrete mixer stopped working. It was irreparable. At great expense, Louis bought a new motor for the concrete mixer, but it never performed as well as the original motor. Frame and gearbox. Motor and mixing drum removed. This little concrete mixer is built on something similar to a wheelbarrow frame, which means you can wheel it around site while it is mixing concrete. You can pour the mixed concrete directly from the barrel into whatever project you are working on. If you know anything about concrete mixers, you’ll know that the bigger ones have to stand in one spot. The mixed concrete is poured into a wheelbarrow and from there taken to where it is to be used. The new motor supplied to Louis all those years ago, wasn’t the same as the original two-stroke motor. The original type of motor was no longer available for purchase. The design of the new motor (four stroke; the differences between two and four-stroke motors are another whole blog post! ), couldn’t accommodate the different angles that the motor was being positioned into while tipping, being wheeled about, etc . Therefore, the carburetor would fill up with fuel, then when tilted the petrol would be dumped into the cylinder and flood engine. In another orientation, the carburetor would run out of fuel and starve the motor. Either way, very frustrating; and so after another two hours of work the concrete mixer sat in storage for a good two decades. We don’t know. But we do know that it was rather worn out when it was purchased, and even worse by the time the motor finally gave in. However, if we could get it going again, it would be worth it, because this little machine would then be able to help us build our house. Kevin also thinks this concrete mixer is of a particularly awesome design so he wanted to see it operational again. We are talking about a concrete mixer; not some kind of classic motor vehicle. There’s no point in refurbishing it to the point of looking brand new. However, it is worth getting it to the point of working efficiently once again. Therefore, quite a lot of work had to be done. The concrete mixer motor turns several gears and drive chains, which rotate the rollers on the front of the machine. The rollers, in turn, rotate the drum in which the ingredients for concrete are added (cement, sand, stone, water). The first thing to do was to replace all the bearings. The original bearings were in various degrees of deterioration. Only one was still good enough to be reused, but since this much effort was being made, all the bearings were replaced. Even the sockets in which the bearings were fitted were worn out to the point that the bearings just fell out. Ten new bearings were fitted with Kevin making adjustments as necessary so that the bearings fitted more snugly. The drive chains were a too loose and slipped right off the sprockets. Kevin removed a few links in the chains to make them tighter and more efficient. Louis and Kevin added fresh grease and oil where necessary. The system uses an oil bath to prevent the chains from wearing out unnecessarily. One roller from the front, on which the drum sits had disintegrated completely. Before it’s exile to storage, it had been repaired with several layers of duct tape. Kevin now has the machinery to make a new plastic roller, so he did. This is an important piece because it is friction between this part and the drum that causes the drum to rotate and therefore mix the concrete. Motor and gearbox re-assembled; ready for testing. See the new roller? The trickiest bit was the motor. As explained above, the carburetor on the new motor (barely used although twenty years old) didn’t take kindly to being moved around. Therefore, Kevin made a new intake manifold and bracket. He rotated the carburetor 40 degrees horizontally so that it now sits on the side of the motor. He also tilted it 5 degrees vertically so that when the motor is tilted in extreme angles, it is more likely to hold the fuel in the carburetor. 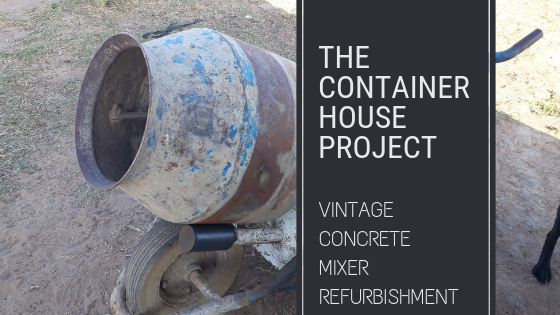 The vintage concrete mixer refurbishment project was hopefully a success! We will let you know when we actually use it. All tested and ready to run! What about hiring your mixer out to special friends once you’re finished with your footings? I’d like to see that little mixer up close. I’ve never given much thought to concrete mixers before, but you’ve brought them to my attention now, and I’ll have a good look next time I see one. Very resourceful refurbishing! I hope the mixer works beautifully now.